Caveat: this is treading the ground of every observational comedian since Michael McIntyre was making revolving-door jokes in utero and so part of an air-travel whinge that everyone identified with this letter – BUT STILL. LOOK AT THIS. The tragic thing was that this wasn’t on China Airlines, Aeroflot or Cyprus Airways – it was Virgin Atlantic. And British Airways didn’t fare much better when I flew with them to Philadelphia last year. 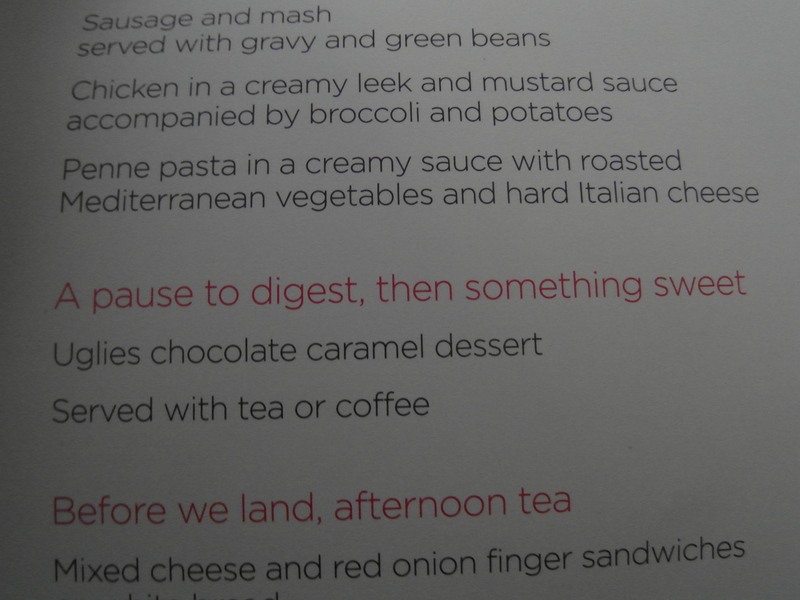 These airlines market themselves as premium and charge corresponding prices – but they don’t even always match the dishes on the seat-back tray to the ones on the menu (the chocolate pudding we were expecting magicked itself into a banana jelly that tasted mostly of Amoxycilin). I know that with fuel prices the way they are that airlines are probably pumping more of our fare into taxes – but when you’ve already paid a few hundred pounds for a ticket, you’d probably part with another £5 in order to have a half-decent meal in front of you. This doesn’t really seem like the kind of place to cut corners (although don’t go limiting that entertainment system or I’ll kick off like a three year-old whose ears won’t pop). Maybe this could be an opportunity for a nifty side business – buy up 20 sandwiches from Pret before you hop on, stuff them in a cooler and whip them out at that gastro-whimper that attacks about 7 hours into a flight. Double the price and reap the rewards when you hit the tarmac. Crayfish and rocket, Mr Branson?